The Carnival Victory is a wonderful cruise ship with a wide variety of cabin types to choose from. Trying to decide which one is best for your needs can be over whelming, but if you have some useful information about the room sizes and features, youll be able to make the ideal decision. All standard staterooms are seven feet from the floor to the ceiling. Each bathroom measures four feet by six feet. Bathrooms located within the suites are slightly larger at four and a half by seven and a half feet. All doorways are twenty-two inches wide by six foot eight inches high. Standard staterooms are either 185 square feet or 220 square feet. The only exception is the Ocean View with Standard Balcony. These rooms measure 195 square feet. Standard balconies are 35 square feet, while extended balconies are 60 square feet. Wrap around balconies are 75 square feet. Windows are either four feet by three feet or four feet by four feet. Some rooms have 17 inch portholes instead of windows. All of them are tinted for daytime privacy, and it is recommended that guests close the curtains at night for additional privacy. All suites come with a five and one half foot by four foot window. Junior Suites with Standard Balcony are 275 square feet with a 35 square foot balcony. Ocean Suites with Large Balcony are 275 square feet with a 65 square foot balcony. The largest suites are the Grand Suite with Large Balcony rooms. These measure 345 square feet and have an 85 square foot balcony. All beds onboard the Carnival Victory are fitted with the exclusive Carnival Comfort Bed ensemble. This includes a 100 percent hypoallergenic duvet and cover, custom pillows, and ultra-fine, ring-spun, satin striped cotton blend pillowcases and mattress set. For those with allergy problems, there is an alternative bedding available. This would include a 100 percent polyester blanket, 60 percent cotton and 40 percent polyester sheet and pillowcase set, and the 100 percent cotton New Generation Pillows. All beds have an eight inch spring mattress, except for the trundle beds and rollaway beds. They have a four inch mattress. Twin beds measure 78 inches by 33 inches, and they can be converted into a king size bed. A single sofa bed is 75 inches long by 32 inches wide. Double sofa beds are 81 inches by 55 inches. Trundle beds measure 73 inches by 29 inches with a 250 pound weight limit. Rollaway beds are 75 inches by 29 inches. Upper berths are 78 inches by 33 inches. They come with a 50 inch long by 6 inch high safety rail, as they are 58 inches from the floor. They also have a 250 pound weight limit, and they set 27 inches below the ceiling. Trundle beds and upper berths are best suited for children and small adults due to their size and weight limits. 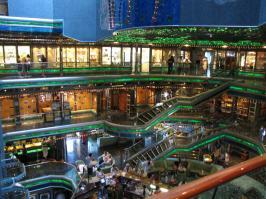 Carnival Victory Cabins are located among eight decks. The Riviera Deck has cabins located above it. This makes rooms on this level quieter than most. Staterooms 1402-1437 may pick up vibrations from the propellers and rooms 1402 and 1405 pick-up noise from the elevator. Twin beds on this deck that will not convert into a king size bed when the upper berth is in use are in rooms 1289, 1296, 1300, 1336, 1370, 1377, 1381, 1385, 1406, 1410, 1423, and 1430. 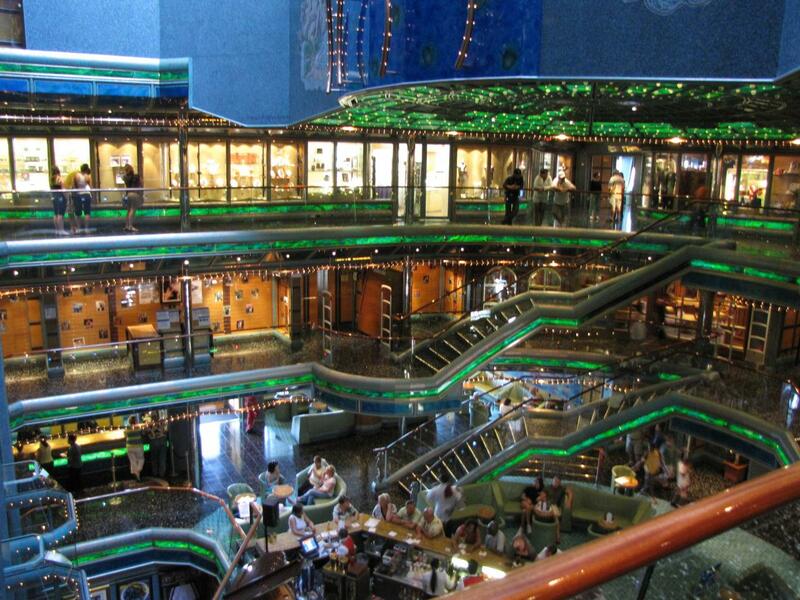 The Main Deck is located under many of the ships public areas, mainly the dining room and lounge. This can add to the noise level within the cabins, but most guests dont notice due to the fact that they are not in their rooms during the busiest hours. Staterooms 2455-2463 have aft-facing views. Cabins 2452, 2453, 2456, and 2457 are oddly shaped, causing them to be slightly larger. Cabins 2201 and 2202 are also slightly bigger than most others. Rooms with twin beds that wont convert into a king when the upper berth is in use are 2295, 2330, 2345, 2354, 2399, and 2443. Rooms on the Upper Deck are noisier than in other areas on the ship. This level is directly above the stage, dance club, bar, lounge, and casino. These public places can remain loud well into the night. Rooms 6396 and 6467 are the loudest. Cabins 6201-6205 have forward facing balconies. Rooms 6207 and 6208 are slightly bigger than other staterooms. Cabins with rear facing, oversized balconies are 6436, 6438, 6440, 6467, 6465, and 6463. These balconies tend to get less wind than ones in other locations but their aft location means a long walk. Rooms 6402 and 6429 are next to the elevator and may pick up noise from the foot traffic. Cabins 6434 and 6461 are the largest on this deck. Cabins with non-converting twin beds are 6205 and 6206. The rooms that have twin beds that wont convert into a king when the upper berth is in use are 6236, 6237, 6245, 6264, 6265, 6288, 6300, 6308, 6311, 6316, 6325, 6333, 6336, 6341, 6349, 6406, 6414, 6428, 6433, 6441, 6445, and 6455. There are decks above and below this level that buffer noises coming from public areas. Staterooms 7276 portside and 7277-7335 starboard share a hallway with the Grand Balcony Suites and the Ocean View Balcony Suites. Both room 7422 and room 7425 have large extended balconies. Grand Suites with a shower and whirlpool tub combination are 7288, 7289, 7294, 7295, 7298, 7299, 7306, and 7307. Ocean Suites with this type of shower and tub are 7233, 7238, 7239, 7242, 7243, 7248-7251, 7258, 7259, 7262-7275, 7278, 7279, 7282, 7283, 7312, 7314, 7315, 7317, 7325, 7326, and 7329. Staterooms with non-converting twin beds are 7206 and 7205. The rooms that have twin beds that wont convert into a king when the upper berth is in use are 7209, 7210, 7214, 7215, 7368, 7371, 7376, and 7379. The Verandah Deck is situated with half of itself under cabins, making for quiet rooms. The other half is under the pool and dining area. Rooms under this half may hear chairs scraping, especially when the crews are cleaning during the night. Staterooms 8422 and 8427 have extended balconies, while 8428 and 8433 have the largest ones on this deck. Rooms 8404 and 8407 are next to elevators, and they may pick up noise from the foot traffic. Cabins that have twin beds that wont convert when the upper berth is in use are 8205, 8223, 8230, 8242, 8250, 8251, 8278, 8279, 8282, 8283, 8286, 8287, 8366, 8369, 8378, 8381, 8386, 8389, 8408, and 8411. This deck is close to the pool and the casual eateries. Rooms 9293 and 9294 are ideal if you plan to spend a lot of time in the pool, as they are the closest. Otherwise, guests may find them noisier than others. Balcony Suites 9206 and 9205 are larger with forward facing views that can be very windy. These rooms also have a shower and whirlpool tub combination. Staterooms with twin beds that wont convert into a king when the upper berth is in use are 9251, 9252, 9259, and 9260. Cabins on the Panorama Deck are the closest ones to the gym, spa, and pool. Several of the staterooms are under the gym. Rooms 1001-1053 pick up the most noise. Rooms 1066 and 1067 are closest to the pool. Cabins with non-converting twin beds are 1003 and 1004. The rooms where the twin beds wont convert into a king while the upper berth is in use are 1044, 1045, 1052, and 1053. Cabins on this deck are near Spa Carnival. Be aware that Camp Carnival Youth Program is one level up, but it is mostly over the gym. Room 1102 and room 1110 can get noisy. Guests will hear parents dropping off and picking up their children. An observation deck overhead adds to the feeling of very little privacy. All rooms are non-smoking.